Happy Thanksgiving everyone! We’re looking forward to some of Granny J’s cookin’ tonight, and maybe a little Christmas decorating later this weekend. Of course, I also plan to do a little online shopping and I thought…what would Thanksgiving be without family, great food, and a great sale? 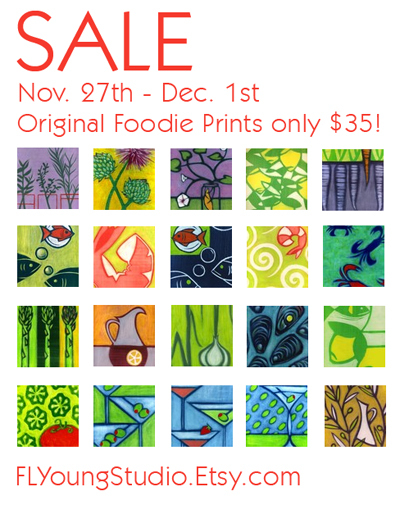 All things considered, I decided the perfect way to show my appreciation for said day, would be to throw an awesome sale on The Original Foodie Prints. Think Saundra Kay’s Okra & Tomatoes or Liz’s Deviled Blue Crab. You’ll even find a festive drink or two over there. So skip on over to the produce stand and take a peek! There’s never been a better time to start a collection, and they make for excellent gifts!